AUBURN GAMEDAY...One Week and Counting!!! My husband, Al, is a true "Dye-Hard" Auburn fan and an Auburn University graduate. I am delighted that he is my guest writer today. 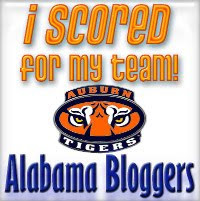 We are celebrating football with "Score For Your Team Football Carnival" over at "Alabama Bloggers". Our lovely host for the carnival is Rachel. The carnival starts the week of August 31st. Be there! Well, that special time of the year is near. The mornings have turned a little cooler, the 'men talk' has turned to 24/7 conversation of how well their favorite team will fair this fall, and every school in the state has the obligatory sign out front that reads “ Go Bulldogs, Tigers, Cougars, Wildcats, Roll Tide, and an assortment of wild creatures. I was traveling down State Highway 49 the other day and had to laugh as I saw the middle school kids at Reeltown practicing for their first game. These little fella's helmets made up half of their body size. Next Saturday, the college town of Auburn, Alabama will swell from a population of 40,000 to approximately 130,000 with the arrival of 90,000 football starved fanatics. It will be an interesting debut in a number of ways. 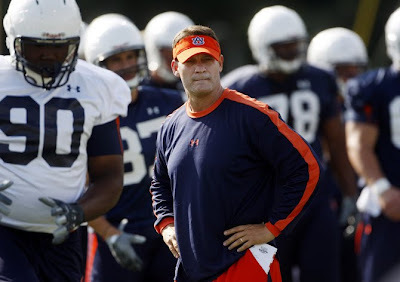 While brats and steaks cook over charcoal, discussion will be dominated by how Auburn’s new coaching staff will succeed. Yes, optimism will be rampant. Auburn had a sad divorce last December. Beloved Coach Tommy Tuberville, one of the most successful college coaches for the last ten years resigned or was fired depending on whose version you want to believe. Don’t feel too sorry for him…he was given a $5 million dollar check to buy Christmas presents (fire me, please!). 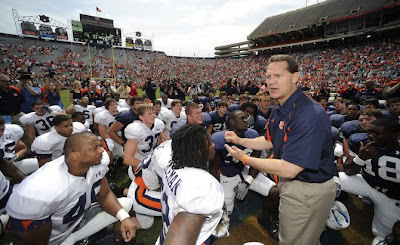 In walks Gene Chizik. Who you ask? Well so did Auburn fans when he was announced last December. Oh, he was the defensive coordinator here five or six years ago, and went on to the University of Texas, and then had a not so glorious two year head coaching career at Iowa State. But a funny thing happened. He hired an infectiously enthusiastic coaching staff, players love them, fans have bought in, and now everyone is on board. Of course, the first game hasn’t been played. Next Saturday will begin with packing the car. Checking, and then double checking, that everything is loaded. Stadium seats, hats, sun screen, coolers, tail gating chairs…and last but not least tickets. Then after the 30 minute drive, one of the more challenging chores of the day, finding that good shady parking spot. Then everyone will discuss other on going games as the band drum choir warms up in the background. 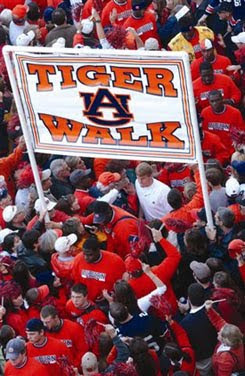 One and a half hours before kick off, one of the more unique traditions occurs, Tiger Walk. Fans will form two lines stretching from the athletic dorm to the entrance of the stadium. 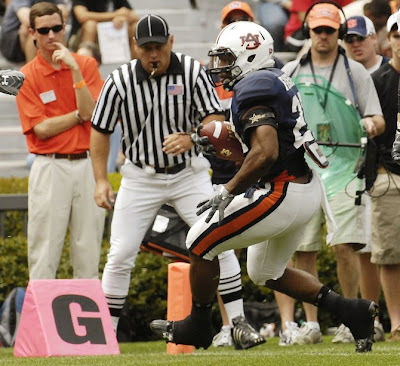 Players and coaches will stream down the middle as five year old to seventy year old Auburn fans high five them, with a heart felt War Eagle salutation. We enter the stadium about 45 minutes before kick off to witness the unquestionably most unique Auburn tradition. Watching the eagle fly around the packed stadium and descend to the 50 yard line to a chorus of War Eagle. (Nova a 10 year old Golden Eagle, and Spirit, a Bald Eagle, share that duty) .Now it is time for some football. Hopefully, this debut will have a happy ending. First games, you never know. 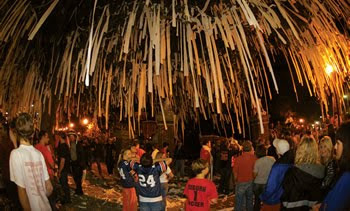 Assuming the good guys win, we will stroll down to Toomers Corner (the original main intersection of the campus) to watch celebrating fans adorn the old oak trees with toilet paper. Then, it will officially be football season. WarEagle VI, Soaring proudly over the sea of orange at the pregame activities!!! No vehicles allowed here - only fans and toilet paper!!! Ending the long, hopefully victorious day, with a big glass of the famous Toomer's lemonade is the perfect finishing touch. War Eagle!! I am counting down the days and minutes until kick off. 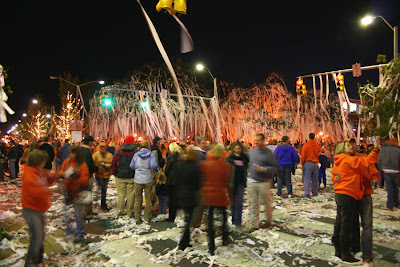 That was a very well-written article on the Auburn spirit and tradition. One of my favorite memories as a child was watching the band's drum line practice outside the stadium before the games. Then as a student one of my favorite memories was our tailgating spot right outside Parker Hall. 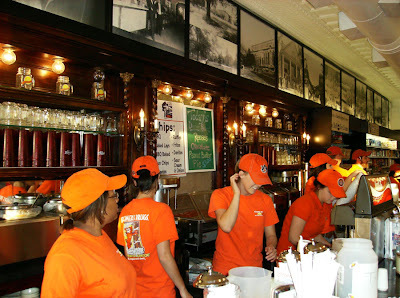 Nothing beats a breezy fall day with a fresh of the grill burger and a cold brew with your Auburn family. Man I miss it!!! 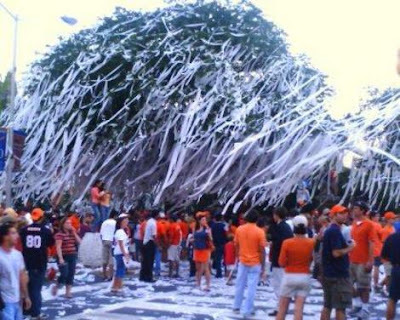 Those pictures of Toomer's Corner are amazing - I would love to see that in person! Except that would mean that Auburn won, and subsequently we lost. So maybe not. But it's still impressive!! I'll have to say, that eagle flying in is pretty impressive. Go Hogs!! WAR EAGLE!!!!!!!!! My brother just got married Saturday, he and his wife both went to AU. 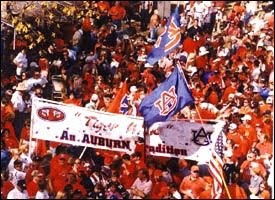 Instead of throwing rice, we all chanted "WAR Eagle" and shook blue/orange pom-poms!!! Doing it up right! I can't wait to go the games this year! Great blog Al. YOu are correct that there is nothing like college football to put excitement into life. all those orange and blue shirts, yelling go team go... WE must be at the SWAMP go gators!!!! Love the pics you have. Sounds like you love Auburn football as much as I do. We are going to the game this week and I can't wait...it should be a great one. 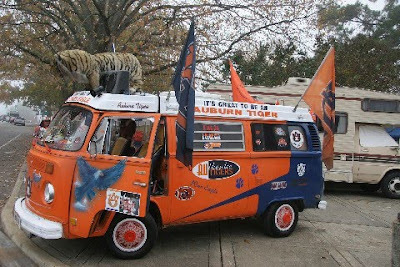 Enjoy the game and WAR EAGLE!!! I gave you a shout out on my blog!